The Bon Secours order of nuns in Tuam have been accused of neglecting infants born out of wedlock under their care, and allowing them to die of abuse, malnutrition or disease. Some have accused them of engaging in a form of holocaust against those children. At the heart of the matter is the former ‘mother and baby’ home run by the order where single mothers were brought out of the public view to have their babies and give them up for potential adoption. 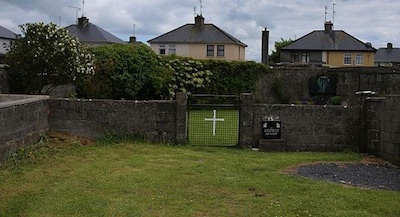 Local historian Catherine Corless said that, based on her research of parish death records, the graves of 796 infants who died at the home are not otherwise identified, and their remains are likely to have been buried on the site. Complicating the issue is that the grave site is known to be linked to a poorhouse dating back to the famine, some 70 to 100 years previously. Remains found in a water tank on the site in the 1970s were thought to be those of famine victims, but many now question that conclusion. While the general mortality rate of infants in Ireland in that period was far higher than now at about 15%, rough calculations have shown that the mortality rate of infants in mother and baby homes may have been up to 50%, or more than three times higher. It is acknowledged there could be many such mass graves across the country. Some 500 babies are said to be buried in the “little angels” plot at Castlepollard. At the mother and baby home in the County Westmeath town, some 2,500 were adopted, including some 278 children adopted by American couples before the home closed in 1971. There have been strenuous demands in the Dublin parliament for the Tuam site to be investigated as a criminal matter, but as yet there has been no such investigation. Local Fianna Fail TD Colm Keaveney TD called for a team of experts led by State Pathologist Prof Marie Cassidy to examine it. “The failure to take immediate action to seal off the area is further evidence of the Government’s disjointed approach to this issue. We need the Taoiseach to take a strategic leadership role,” he said. Sinn Fein’s Gerry Adams called for a full inquiry. “The Church and State cannot be allowed to abdicate their responsibility for what occurred. It is time now for the government to face up to this shameful period of our recent history and shine a light on the dark secrets of mother and baby homes,” he said. He said the culture that arose out partition was partially responsible for the kind of Irish society that tolerated mother and baby homes. The party’s deputy leader Mary Lou McDonald said there should be no attempt to avoid the issue. “What is needed is a full public inquiry into the practices at all mother and baby homes across the State, to shed light on what led to the shocking infant mortality rates, the burial of untold hundreds of babies in mass graves, and the routine illegal adoption and trafficking of an unknown number of the surviving children,” she said.